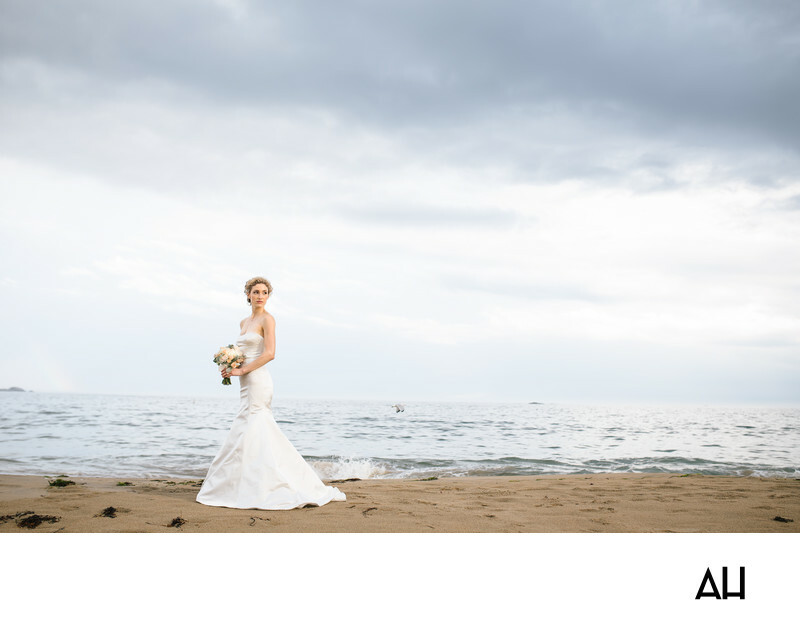 A Beach Wedding Photographer is in high demand for the great number of couples who wish for a wedding ceremony by the sea. Beach weddings have become increasingly popular over the years as couples yearn for a break from their busy lives and for a place where they can feel a sense of calm and serenity while saying their vows. Some also choose beach weddings for the sense of adventure they offer, especially in regard to destination beach weddings that allow the bride, groom, and their guests to make a vacation out of the event. This Massachusetts wedding did not require most guests to travel far, but still provided the couple and their loved ones with a picturesque escape. The scenery of the Singing Beach Club was a dream for a Beach Wedding Photographer. The photograph above of the bride is the epitome of peace and tranquility. The image shows the waves of the North Shore roll in behind the bride, who gazes thoughtfully over her shoulder. She stands still in front of a water color like backdrop of clouds and a crystal sea. Her dress is simple, yet incredibly elegant, and it contrasts well with the color of the ocean washed sand. The only other being in the picture is a seagull that flies low over the water, leaving the bride to be the focal point. She seems to breath grace and will surely remember the contentment of this day forever.